My art is a reflection of who I am and how I got here. Having always been a country girl, I appreciate all things great and small in my life and environment. I strive to reflect overlooked objects and little things in day-to-day life in my artwork. I hope that my work will instill an appreciation for the beauty found in the simple things that surround us all in our every day lives. I learned a valuable lesson this week that I want to share with you. My painting 'Vegetable Medley' was juried into the Louisiana Watercolor Society Exhibition in New Orleans and it's time to ship it. It is on a full sheet of watercolor paper, 30 x 22, has a 3 1/2 inch mat and a 2 1/2 inch frame. making it 42 x 34. Therefore, it is to big for my 42 x 35 box. Not only was I going to have to buy a bigger box it was going to cost $140-150 to ship it one-way and I have to pay for return shipping too. The 42 x 35 box shipping rate is only $45. Now that's a huge difference! I had just about decided to not send it and take the penalty of not being in the show for 2 more years. Then I started thinking of getting a smaller frame but it's a custom size so no time for that. Then it dawned on me that I had a metal frame that I had taken off a painting because it had a dent in it. And then I thought "was that painting by any chance 'Vegetable Medley'?" I went to my storage room and brought it home and viola`it fits!! I think it's 1 1/4" wide. Now the painting will fit in my 42 x 35 box and only cost $45 to ship! I'm soooo excited! The moral of this story is 'check to see how much it will cost to ship a painting before you put a wide mat and frame on it'. Just a few inches difference almost cost me $200. Ummmm! Now what art supplies can I buy with that money! Now I will have a chance to win an award too! 'Appletini' came about when I was trying to think of something unique to paint. I was thinking of different types of drinks but lots of people paint those. So I thought why not put slices of fruit in martini glasses and viola! I love using the text fabric in my paintings because it adds a French flair and a linear design. Marsha Chandler is a watercolorist who is realizing her childhood dream of being a professional artist. She creates expressive still lifes and vivid landscapes which express her love of details and objects or scenes that evoke a sense of history. 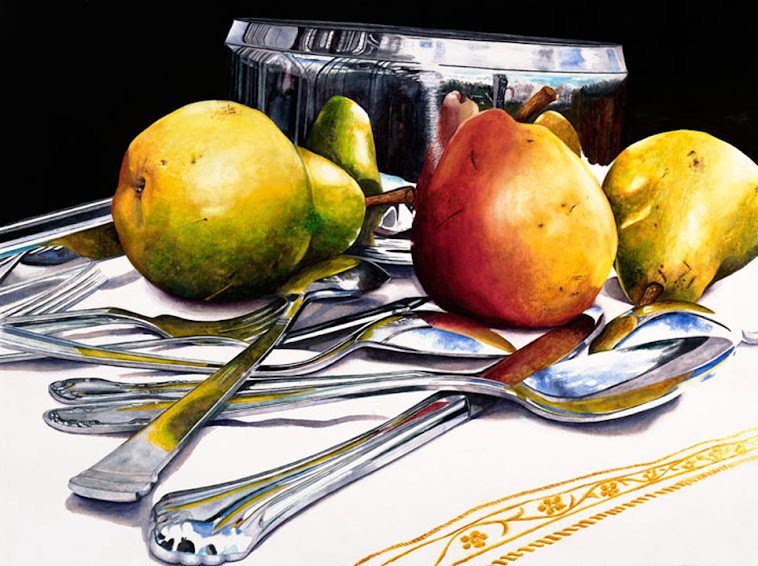 She finds subjects for her still life paintings in common objects that surround her daily—even a trip to the farmer's market for fruits and vegetables inspires her to paint Her paintings have been accepted into regional and nationals juried exhibits and have garnered a number of awards. In addition, she has had several solo shows. 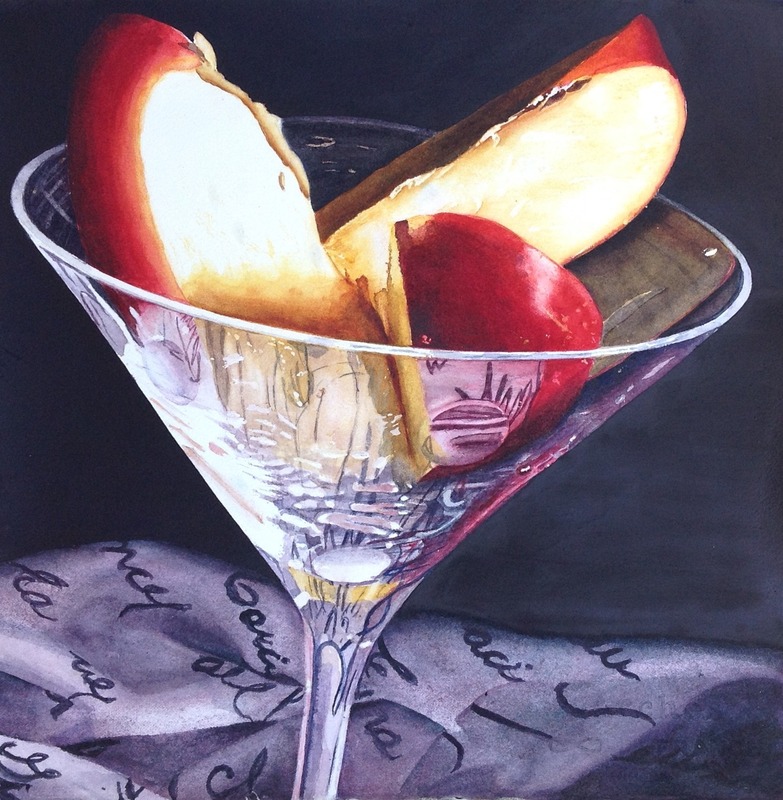 Marsha is a Signature Member of the Georgia Watercolor Society and Watercolor Society of Alabama, Advanced Merit Member of the Atlanta Artists Center, Juried Member of Women Painters of the Southeast, member of the Southern Watercolor Society and Douglas County Art Guild. 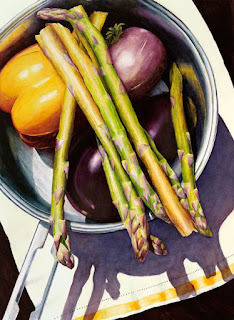 Using vivid colors, texture and light, I paint vibrant, close-up views of everyday objects. I paint in a representational style, but I like to complicate my paintings with the distortions of reflections, refractions in glass and silver, and shadows that move in and out. I try to evoke a feeling of intimacy in the viewer and draw him or her into the intricacies of the painting to see and experience a new perspective or thought about the subject. My medium of choice is watercolor. I love the way it flows, its luminosity, translucence and surprises, and the way it allows me to capture the special qualities of light.